Soon after one of the many snowstorms we suffered this past brutally cold winter, Steve Ed-wards and I sat down for a warm chat with Loretta E. Lynch at the Attorney’s Office in the East­ern District of New York (which was open and ready for business despite the weather). Loretta Lynch has had an exciting and dy­namic legal career. After graduat­ing from Harvard for both her un­dergraduate and law degrees, she worked at Cahill, Gordon & Rein-del, and then joined the U.S. Attor­ney’s Office in the Eastern District of New York, eventually rising to become U.S. Attorney from 1999 to 2001. She then became a part­ner at Hogan & Hartson, where she remained until May 2010, when she was confirmed by the Senate to once again become the Attorney. While at Hogan, she also served as Special Coun­sel for the International Criminal Tribunal for Rwanda, and helped investigate allegations of witness tampering and perjury. Question: It seems the busi­ness of prosecuting and judging is more in the public eye than it ever has been. What do you think when you read blogs and other postings about the activity of this office or other prosecutors? Loretta Lynch: In general, it is a good thing to have more informa­tion out there, to inform the public about what we do and to get the public active in these issues, but it can be a challenge to get things right. People outside the system looking in often do not have the benefit of the data and analysis that goes into certain decisions. Question: Are there any in­stances where you thought that problem was particularly pro­nounced? 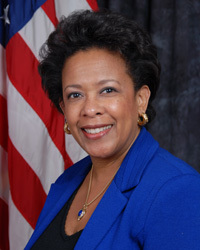 Loretta Lynch: By way of ex­ample, a federal judge in Iowa recently wrote an article about what he viewed as the arbitrary and often harsh application of sentencing enhancements for repeat offenders. When he re­viewed the sentencing data that he had, he was very concerned. The data he relied upon, how­ever, was several years old, and not reflective of current practice. DOJ policy has been changed to permit more discretion to be used in applying enhancements, as well as in determining how to plead out a case. Data by itself also does not tell the full story of why some cases are charged or disposed of in a particular manner. Raw data does not cap-ture the impact of a crime on the community, which can dif­fer from place to place. It also does not effectively capture in­stances where we do not bring certain enhancements. I think it is healthy and good to have a public discussion of these is­sues, but the government often has to refrain from public com­ment, especially about pending cases, and that can make it diffi­cult for everyone to have a fully informed discussion. Question: How do you view the changes in sentencing since your first tenure as U.S. Attorney? Are they changes for the good? E.D.N.Y. practice over the years. This greater discre­tion does not just redound to the government’s ben­efit, but also allows the de­fense bar greater space in which to advocate for their clients. There sometimes appears to be the percep­tion that prosecutors want to lock up everyone for as long as possible. That is not true. Our positions on sentences are much more nuanced than that. In any event, we as a society cannot af­ford such thinking. Question: In movies and televi­sion, local prosecutors are often portrayed as hard working and fo­cused on the community, whereas the feds are seen as something of the bad guy, trying to take over from local prosecutors and inter­fering. From your perspective, how do you see it? Loretta Lynch: I see it as a partnership. Let me give you an example – gun violence. This is a huge problem in communi­ties such as Brownsville, here in Brooklyn. We will team up with ATF and local police units, fol­lowed by social services to try and help the community. We also have a very strong gang practice, and work well with the police and district attorneys in all of our counties to identify gang activity that also implicates the federal interest. On Long Is­land in particular we work with an outstanding task force of state and federal law enforcement of­ficers and have made real inroads into a difficult gang problem there. Question: So turf battles are not as frequent as people think? Loretta Lynch: In an area like New York, where you have a plethora of talented prosecutors’ offices as well as law enforce­ment agencies you will find over­lap in matters and disputes that have to be worked out. More of­ten than not, however, we’re all focused on the best way to solve the particular problem. When problems do arise, I have always found the best way to solve them is through effective communica­tion and a focus on the victims. The bottom line is that you never want ego to determine where or how a case gets charged. Question: You’ve worked with Ken Thompson, the Brooklyn District Attorney. Loretta Lynch: We tried the Ab­ner Louima case together when Ken was an AUSA. There, the federal government came in at the request of the district attorney’s office. Often, in a police brutality case, the district attorney’s office starts the investigation, but we work with them to determine the best venue for charges that may result. Everyone works together. Ken comes from that background and we have a very good working relationship. Question: Changing gears, do you think the system incarcerates too many people? Loretta Lynch: That is really an impossible question to an­swer. It presupposes that there is a right number. I think the better question to ask is whether we are putting people in jail for the right reasons. Who is it that needs our protection? A major focus in our office is on crimes involving vulnerable victims, from crimes against the elderly to human trafficking rings. In this district we’ve seen people target their neighbors, elderly people, or discrete groups such as the deaf community with Ponzi and other fraud schemes and literally wipe them out. We’ve seen crime families target young girls in other countries and lure them to the U.S. with the promise of romance and a better life and then sell them into sexual slavery. We also have a violent crime and gang problem on Long Island. I think the right questions to ask involve – what are the crime problems in your area and how should you focus on them. Then you have to see how incarceration and other remedies fit into that framework. Question: We’ve heard it said, and the numbers may not be pre­cisely right, that the U.S. has less than five percent of the world’s population, but it has almost a quarter of the world’s prisoners. Doesn’t that suggest we are over criminalizing activity? Loretta Lynch: It depends upon your perspective. We federalize carjacking, along with the failure to pay child support. I can say that from where I sit, these crimes are not causing the bubble you re­ferred to. It is narcotics sentences that are creating the bubble. The irony is, however, that some have expressed the view that we are not putting enough people in jail, in particular for white collar crimes. Question: Can you tell us about the re-entry programs your office is running? Loretta Lynch: The Center for Court Innovation has been doing great things in this area, along with the district attorneys’ of­fices. They have expanded their program to include women, not just men. It has worked for 10 years, to help people finishing their prison terms reintegrate into society. Literacy is a large core of the problem, and fixing it is a big need. If you cannot read, you are marginalized in our society and you cannot succeed. For our part, we work with them to edu­cate people about the penalties for re-offending, and how that can be a federal crime with seri­ous consequences. Question: Crime prevention is no doubt important, but why should prosecutors, trained to ar­gue in court, be doing that as op­posed to social workers or other trained professionals? Loretta Lynch: We do more than that. Our job is more than just ar­resting people. You cannot arrest your way out of the crime prob­lems that we have. My job is to protect the people in this district. We have eight million people in the Eastern District of New York. And when I send someone to jail, I think about the people they leave behind, in particular the children, as well as the fact that they will come out of jail one day. I think part of our responsibility is to think about those issues. One of the things I did upon returning to the Office was to create a require­ment that my AUSAs perform one community service event each year. For example, My Orga­nized Crime section works with the Brownsville re-entry program. We also spend a great deal of time working with student groups, edu­cating them about the legal sys­tem and what we do. We talk with community groups about fraud prevention, we meet with schools and industry groups about pre­scription drug abuse, and a host of other projects. All of this is part of our crime prevention function. Question: Can you tell us a bit about the Arab American and Muslim Outreach Program? Loretta Lynch: This was a policy initiative that came from the White House. We wanted to be active in our outreach to this community because of the back­lash after 9/11. We saw numer­ous attacks on people as well as religious institutions that were or were perceived to be Arab or Muslim. The first reported in­cident of 9/11 backlash was the murder of a Sikh individual by someone who believed him to be Muslim. Question: Many people are strongly opposed to imposition of the death penalty. How do you deal with that? Loretta Lynch: It can be the hardest part of the job. The fo­cus has to be on the nature of the crime and the impact on the victims. After extensive review of a death eligible case, I make a recommendation to the Attor­ney General and it is ultimately his decision. The conduct must be well outside the boundaries of human behavior to argue that someone has forfeited the right to live. In the Wilson case, the Sec­ond Circuit had reversed imposi­tion of the death penalty because of arguments that were made dur­ing closing. We reviewed it again after the reversal and decided to re-seek the death penalty. That was not an easy decision. But it was based upon the nature of the crime. The defendant showed no remorse for the execution of two undercover police officers, one of whom pleaded for his life for the sake of his children just before he was shot in the back of the head. It was a cold-blooded execution done as part of a robbery. After­wards, the defendant wrote a rap song about it. Even with all of that, it was still a very difficult decision. Question: Looking forward, what are some important areas for your office? Loretta Lynch: We have a very strong focus on national secu­rity and terrorism related cases. In fact, since 9/11 the E.D.N.Y. has tried more terrorism related cases in Article III courts than any other district. Our white col­lar practice is strong and varied, and runs the gamut from securi­ties fraud to the Foreign Corrupt Practices Act to health care fraud. We have been very active in cy­bercrime, focusing on interna­tional hacking rings, and have an active program to combat gang violence. Our public corruption program is also very strong. On the civil side, we work on com­plex civil frauds such as our 2012 $1 billion settlement with Bank of America/Countrywide over its FHA underwriting practices. We continue to have a strong focus in that area. I am tremendously proud of the hard work and dedi­cation of the Assistants and staff in the E.D.N.Y.